Powers/Abilities: Magni possessed the conventional attributes of the Asgardian gods including superhuman strength (potentially Class 100), stamina, resistance to injury and a long life enchantment. He flew about on a flying horse, but with the use of Mjolnir, he could transverse dimensions and fly through the air pulled by its handle. History: (Thor II#68 (fb) - BTS)- Magni was the son of Thor, the Lord of the Asgardian Gods, and Amora the Enchantress in the alternate future known as Earth-3515 where the gods of Asgard had taken over the Earth and renamed it New Asgard. (Thor II#73 (fb)) <2020 AD> - Shortly after Magni�s birth, Balder secreted Captain America, Wolverine and Doctor Strange into New Asgard�s royal palace. Backed by the Thing, the Vision and the Hulk, Wolverine broke into Magni�s nursery as, backed by the Council Elite of the Pantheons, Dr. Strange nullified the Odin-Power. The Thing and the Hulk then attacked Thor as Balder threatened to kill Magni unless Thor removed the Asgardians from Earth. Having slain the Hulk and the Thing, Thor was being pummeled by Captain America as Loki killed Balder. Thor then killed Captain America with a blast of Odin-power upon realizing his son was safe. (Thor II#75 (fb, BTS))- As an adult, Magni encountered the Lady Sif living in exile although everyone else believed her to be dead. Thor II#68) <2170 AD> - Following the realization that Jane Foster had survived the destruction of New York City resulting from the previous Asgard�s demise, Amora presented Magni to Thor as his heir. Thor even commented on how fast Magni was growing into an adult. 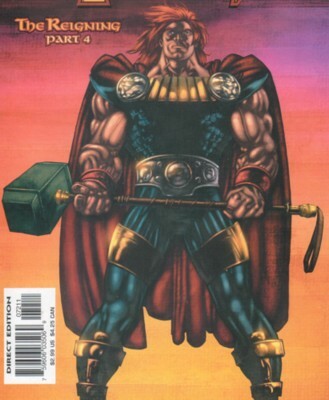 (Thor II#70)- Magni was intrigued by a young girl named Jordahl who he helped to escape Loki�s dungeons. Beyond the walls of Asgard, he confessed to her his distaste and uncomfortable state around his Uncle Loki. (Thor II#71)- Uninterested in royal affairs, Magni courted Jordahl and escorted her home before returning to the confines of the palace to meet Thialfi, his father�s ward since returned from the past. (Thor II#72)- Returning to the castle, Magni was reprimanded by Thor for disappearing from the royal palace unsupervised. Meeting Thialfi, he became put off by the royal respect that Thialfi showed him. When Loki revealed that Magni had been with the young girl that had escaped his dungeons, Thor tried to remind him of his princely duties, but Magni wandered off rather than having any part of it. Thialfi then remarked how much Magni reminded him of the younger Thor of his timeline. Flying off to battle with the Warriors Three and Thialfi, Magni was regaled with stories of his father�s past pretending to be a mortal to live on Earth. Confronting mortals using illegal technology, Magni learned for the first time how much the mortals of his time hated the gods. He realized they were willing to die in order to live free of them. Loki, meanwhile, impersonated Magni to confront Jordahl. (Thor II#73)- Magni, Thialfi and the Warriors Three were confronted by Thor for inciting a riot when their duty was to quell what was considered a religious disturbance. Afterward, Thialfi revealed the nature of Thor�s past confrontations with Loki. Believing they shared similar qualms about Thor�s control of Earth, Thialfi revealed his own dissatisfaction to Thor�s treatment of mortals, but rather than agreeing and fearing treason, Magni instead left without a word. He retreated to meet with Jordahl but instead discovered in his absence that she had been abducted by Loki and her home destroyed. (Thor II#74)- Magni broke into Loki�s Reconditioning Center in Arizona to rescue Jordahl and free her before she could be reconditioned. He then spirited her off to safety. (Thor II#75)- Realizing Jordahl had lost all memories of who she was, Magni heard from Sif the events that had changed Thor�s faith in mortals and which had resulted in her banishment. Upon returning to New Asgard, Magni learned of an attack on the royal palace in his absence and the attempted assassination of his father by Thialfi. Magni witnessed the execution of the radicals who had created the attack, one of whom was Kya, the daughter of the Scarlet Witch. Realizing Magni was their last hope, Kya emerged as a true spirit after her death and lead Magni to the whereabouts of his father�s lost hammer, Mjolnir. Finding himself worthy of the hammer, Magni claimed it as his own. (Thor II#76)- Realizing the legacy of Mjolnir, Magni became incensed that Kya insinuated that his father was no longer worthy of it. He revealed its existence to Sif and she saw it as Odin�s legacy that Magni should overthrow his father. Using Mjolnir, he returned the two of them to the original Asgard left abandoned when Thor moved the Asgardians to Earth. He encountered the troll Ulik who revealed the far-flung effects of the gods� absence from Asgard and the consequences of it to the other races of Asgard not foreseen by Thor. More convinced now of his father�s failings, Magni took Sif to New Asgard and challenged his father to prove he was still worthy of Mjolnir by lifting it. (Thor II#77)- Confronting his father, Magni pressured and challenged Thor to lift Mjolnir just before Desak the slayer of gods returned to finish his stalemate with Thor. Realizing his father was unable to wield Mjolnir, Magni confronted Amora and accused her of marrying his father to just further herself. Desak meanwhile beheaded Hogun of the Warriors Three as he charged through Asgard killing everyone in his path. Thor confronted him and quickly realized the Odin-force was ineffective against him. Magni entered the fray with Mjolnir to defend his father, but still inexperienced in its use, Desak quickly knocked him out and began pummeling him. (Thor II#78)- Amora unleashed a mystical assault on Desak to rescue Magni just before Thor unleashed the full power of the Odin-Force upon him. Magni returned fighting with Mjolnir as well moments later. Loki meanwhile released the Destroyer with the life force of Tarene the Designate not realizing that she had created Desak years ago before her death. Realizing that Tarene would not destroy him, Desak released her from it and then merged with the Destroyer to fulfill her desire to destroy the Asgardians. (Thor II#79)- Realizing that Loki had guided Thor to fulfill his personal intentions and suppress the full potential of mortals, Magni attempted to bury Desak to stop him from killing the Asgardian Gods, but the God-Slayer actually started recovering from his attack. Tarene inflicted Magni a near-fatal shock for that attack, and Sif and Amora spirited him to safety. Thor realized the errors that had brought him to where he was now and reclaimed Mjolnir now that he was worthy of it once more. Magnifying the Odin-force through it, he then beheaded Desak and came to terms with Tarene. Revealing he was more proud in Magni than ever before, Thor traveled back in time to just before Asgard�s destruction to remerge his past self with the portion of humanity removed from him long before. Preventing Asgard�s destruction and removing it from earth in the past prevented the Earth-3515 events from happening in the mainstream timeline. 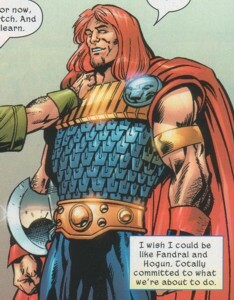 Magni�s immediate known relatives are listed above, but it is to be assumed that his relatives would include further Earth-3515 counterparts of known Asgardian gods from mainstream Earth-616. There is a mythological basis for Magni. He was son of Thor and the giantess, Jarnsaxa, a daughter of Aegir. The mythological Magni was twin-brother of the Modi, god of courage, and was strong enough to rescue his father from being pinned under the leg of the giant Hrungnir. As a reward, he was given the magnificent horse, Gullfaxi, who had belonged to the giant. Both Magni and Modi survived the destruction of Asgard. While none of this applies to the Magni of Earth: Reigning, it might apply to the Magni described by the Sentient Eye of Odin. It is not known for certain if the Earth-3515 timeline possibly exists in another quantum reality or not. The reality of Earth-Forever Yesterday has been shown to be in existence despite supposedly being destroyed. The sheer mechanics of temporal realities within the reality of the Marvel Universe has been shown in the past that traveling back in time does not change the present (even if it is in the future) and sometimes even postponing the inevitable (such as Doomsday in the Terminator films or even Days of Future Past in Uncanny X-Men�s �Fall of the Mutants�). If anything, going back in time to the �present� from the �future� and changing the events leading to that �future� only forces a point of divergence to occur and places that future time in another timeline. As a result, Thialfi is still missing in the present and the Thor who came to the present to change things back obviously had to go somewhere (because if he blinked out of existence as a result, then he couldn�t have appeared from the future to fix things). The mere concept certainly leaves the door open for Magni to possibly pop up again. --Right. There is an Earth-3515 timeline. The dates mentioned in the profile MIGHT be topical (for example, 2004 might mean 16 years after the modern era), or they may be real. Not every alternate reality has the same sliding time scale as Earth-616.